Choi Joonyong also runs the Balloon And Needle Label, and appears as part of the sextet that perform Dotolim, a graphic score composed by visitiing American Jason Kahn, The piece takes its name from the tiny room in which it was recorded, an office used by Park Seungjun by day, doubling as a minuscule performance space at night, Kahn's score dictates when each of the musicians should play, and hints at volume, density and texture, his analogue synthesizer is the only traditional instrument used here, with the five Koreans utilising vibrating speakers, amplifier, hard disk drives, turntable and Choi Joonyong's opened CD players, The music they create is intense, a blend of assorted screeches, ticks and whistles, coalescing in places into a brittle, detailed stream that is as claustrophobic as the room in which it was created. Subtle without worrying about traditional ideas of beauty, Dotolim's palette is raw, reflecting the musicians' backgrounds. However the choices and placement of sounds are highly refined, in many ways supplanting their severity into a traditional semi-improvisational setting to create a refreshing new perspective on the music. A Kahn composition realized by himself (analog synth, short wave radio), Ryu Hankil (speaker and piezo vibration), Park Seungjun (amp with spring reverb), Jin Sangtae (hard disk drives), Choi Joonyong (opened cd players) and Hong Chulki (turntables), recorded in Seoul in November of last year. My first impression, knowing that it's Kahn's work (see score below) was how unrhythmic it was, at least overtly. Perhaps my experience has been skewed but almost everything I've previous heard of his has either a strong pulse or at least a subtle throb. Here, the results are by and large more dense than what I've heard before from the five, fine Korean improvisers, but otherwise entirely in keeping with their previous output. As can be clearly seen, the piece runs 70 minutes, divided into 5-minute portions, during which between three and six musicians are always playing (closer inspection reveals between about minutes 55 and 56 where perhaps only two are in operation). Each player is given four or five "blocks" of time during which he, I assume, reads the trademark Kahnian illustrations and interprets them as he will. The two levels in each individual's line suggest dynamics. And it sounds mighty swell. As I said, it's very dense, unremittingly harsh and insectile, sometimes sounding like squadron of dental drills. Through this, the sextet does a fantastic job of crafting sounds that manage to be quite distinguishable from each other, a metalloelectric forest made up of distinctive species, more often than not sounding quite delicious in apposition and integration with each other. This is particularly noticeable when a relatively quiet section follows a noisier one (minutes 25-35, for example). As the volume levels up around the 45-minute mark, you even begin to get very vaguely tonal undercurrents, almost as though conjured up via sympathetic vibrations between two or three ultra-dissonant sources. The first time through, I found it perhaps a bit overlong but subsequent listens revealed much more fascinating detail and space, especially in the louder sections, that offered a hyper-rich strata of furious activity I found quite easy to luxuriate in and enjoy the skin-pricks. A fine recording, by all means get it. More and more it seems that Jason Kahn is approaching the status of a real composer, doing graphical scores and such like. He was in South Korea and created a score to be performed by six people, including Kahn himself. He plays his usual analog synthesizer and short wave radio. The other five players are Ryu Jankil (speaker and piezo vibration), Park Seungjun (amp with spring reverb), Jin Sangtae (hard disk drives), Choi Joonyong (opened CD players) and Hong Chulki (turntables). Together they perform Kahn's score, which consists of symbols but which make much sense as a composition. Its not easy to isolate various sound sources here, as many seem in some way related. There is a lot of high scraping sound and what those are? Hard disk drives, opened CD players, spring reverb? But I guess these close sounding sources enhance the idea of one work, and not that of some improvised work, although on the other hand each of the players are more free in how to perform their part of the score. Throughout there is a massive sense of those similar scraping sounds, sometimes with deep end bass rumble (Kahn's synthesizer perhaps) and other sounds that drop in and out of the mix. The graphical score here serves as a guideline for use, and doesn't call for a strict interpretation and each player can add whatever he wants and with whatever force or subtleness or by creating small variations in approach. Seventy minutes is a long ride, but surely a rewarding journey. Quite noisy but good solid and never over the top. In 2006, Zurich-based Jason Kahn visited Seoul for the first time while on tour. During his stay, Kahn befriended fixtures of the Seoul improvisation scene. This composition, Dotolim, was penned for these Korean gentlemen, receiving a 2009 performance in the titular art space. By day, Dotolim is Jin Sangtae's office space; by night, it is the minuscule venue that has since 2008 served as the epicenter of Seoul's burgeoning avant-garde scene. Written for Hong Chulki (turntables), Ryu Hankil (speakers and piezo vibration), Choi Joonyong (opened CD players), Jin Sangtae (hard disk drives), Park Seungjun (amp with spring reverb), and Kahn (analog synth, short wave radio), Dotolim exploits the unconventional instruments of the aforementioned players and their idiosyncrasies. Kahn "wanted [Dotolim] to emphasize the density of this group of musicians, both in terms of their sound... and of the space itself, which seemed at times barely able to contain the mounting blocks of sound [the group] generated during the recording session." Balloon & Needle's recording actualizes Kahn sentiments into a piece that is claustrophobic, unnerving, and harsh. The mechanical, unorthodox instruments generate tensions seldom espoused by their traditional counterparts. Whether solo or intertwined, deconstructed CD players and speakers do not mingle well nor evoke comfort in even the most experienced of listeners. To confound this unease, at least two players are active at any given time, with many instances of sextet crucial blasts. But despite this fullness, each scrape, each robotic twitter is discernible. The clarity is so sharp that the listener can follow the score without much effort. While completely detached from conventional theory, Kahn's score of lines and scribbles is effective precisely because of its abstract economy (those encircled stars totally sound like Jin's hard disks). After having sat through the album once, the score transcends its primitive elements. Dotolim's angular squiggles and patchwork of dots take on aural meaning, even while the record is paused. In fact, all of its 70 minutes are enthralling, notably the crescendo commencing at the 40-minute mark. This movement builds for 15 minutes, eventually adding each player into a packed spectrum of inorganic noise, singeing every node of aural sensation, only to end cold into a pianissimo, rhythmic scratch. And it works wonderfully. Excluding Manual's 2009 compilation RELAY: 2007-2008, no other release features so many Korean improvisers playing at such a high level. Beyond a showcase of esoteric noises, beyond a statement of Kahn's composing skills, Dotolim is an excellent document of the happenings in Seoul, capturing the zeitgeist of Seoul improvisation while presenting these musicians as kindred spirits to the adventures in Tokyo and at loopline. Novembre 2009, a Seoul, dans l’espace exigu de Dotolim : familier de la scene coreenne depuis une visite de 2006 (Signal to noise vol. 6, disque For4Ears), Jason Kahn (ici, synthetiseur analogique, radio) s’entoure de Ryu Hankil (micro, micro-contact), Park Seungjun (ampli, reverb’), Jin Sangtae (disque dur), Choi Joonyong (platines CD ouvertes) et Hong Chulki (tourne-disques), pour elever des nuees electrostatiques urticantes qui, par phases et paliers, jusqu’a des altitudes d’une complexe frenesie, font et defont leurs agglomerats dans une ebullition fourmillante. Les matieres ont beau etre des plus metalliquement reches, tirees d’un materiel technologique detourne si ce n’est eviscere (ces platines qui patinent), grincantes et plus aleatoires que les fameux cracked everydayelectronics, leurs jeux d’apparition-disparition donnent a l’abrasion generale une etonnante plasticite. This record is a product of Jason Kahn’s Seoul trip in 2009, made possible by Ryu Hankil’s organization of a number of concerts involving the American. The will of collaborating with “the core group” of Korean improvisers – which he had firstly met three years prior – turned into this recording at Dotolim, a minuscule site also used by hard disk drive manipulator Jin Sangtae as business office. 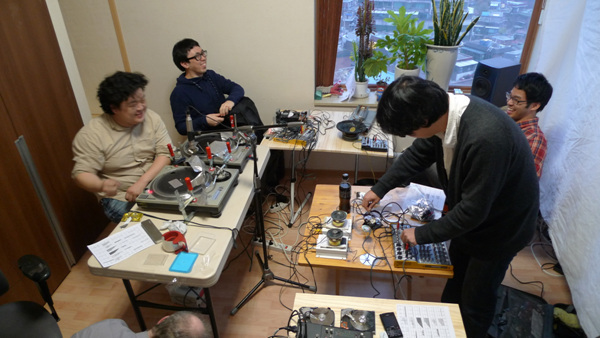 A graphic score was handed to the five performers accompanying the designer’s analogue synth and shortwaves; besides Jin and Ryu (speaker and piezo vibration) – the sextet featured label manager Choi Joonyong (opened CD players), Park Seungjun (amp with spring reverb) and Hong Chulki (turntables). The composer reports that there was the bare minimum space in the room to move and operate the machines. One imagines heat and sweat, everybody hunched over a piece of equipment, the unremitting shuddering of an uncontrollable sonic organism led by six men towards uncharted territories. The music benefits from the alliance of shortwave, drilling percussiveness and organic distortion, which represent its predominant components. The propulsion comes from destroyed automatisms originating an incessant clatter pervaded by a sort of acrid bubbling; establishing who does what becomes a matter of imagination, and is actually pointless. Density, rawness and intelligibility proceed at the same pace: we can choose a path to follow while remaining able to monitor the different directions to which various intuitions spread. Even stasis, in the rare moments of presence, sounds crusty and tense until it gets mangled by evil droning forces, as it happens from the 45th minute on in a memorable, literally dangerous section. A network of inquisitive minds giving birth to a creature whose deceivingly mechanical coldness hides a passionate effort to interpret Kahn’s intentions at best. Tune in with the head of a participant and let these energizing defluxions chart your mind. You won’t be disappointed. Dotolim is among the most exciting music I have enjoyed in some time, but that's not a recommendation. This is a steep climb for most, I am sure, as the Seoul musicians who have maintained Dotolim as a vibrant, if claustrophobic, performance venue [it's the size of a walk-in closet], are seriously pushing their music towards the brink of collapse with great humor and a serious intensity. If you thought their antecedents in improv and new music were appropriating the detritus of orphaned sounds for their lexicons of extended techniques, you ain't heard nothing yet-Dotolimbubbles, scrapes, screeches and lurches along, Kahn's score of abstract symbols for each player serving as hints for their wending their noisy way into a great, massed wall of undomesticated music, the sprung, teased out innards of the crew's cracked open disc players, hard disk drives, whacked out turntables and short wave radios [some great captures pulled into that hermetic room] coalescing and pulling apart with ugly beauty. The crescendo near the 60 minute mark is thrilling, no matter the sounds sourced, a hair-raising realization of Kahn's stated intention for the piece- I wanted [Dotolim] to emphasize the density of this group of musicians, both in terms of their sound... and of the space itself, which seemed at times barely able to contain the mounting blocks of sound [the group] generated during the recording session. Dotolim is made of nearly every ugly sonic byproduct you can imagine issuing from the mechanized, throw-away toys of our time, with meticulous attention to the piece's overall shape, sound placement and the player's conjoining of elements. Hong, Ryu, Choi, Jin and Park, in their meeting with Kahn, sparked a recognition and embrace of the creative possibilities for music in the cast-off and broken. Kahn provided the score, and the rest is noise.